There’s a tiny little cul-de-sac in Oakwell Farms, barely an elbow in the road, where several garden homes sit beneath a multitude of large, shady oaks. It’s obvious that DeeAnn and Skinner Simpson’s home belongs to a gardener because huge baskets of ferns hang from the oaks around their home. The landscape near the front door is lush and fragrant, in spite of a dry summer. The alluring exterior promises an interior to match. For the Simpsons, the trail to Oakwell Farms began two years ago with a decision to downsize and simplify their lives. They raised three children in Olmos Park in a 1929 Mediterranean home, complete with a pool, slide and inviting party house. When the children left home, the couple moved to a condo in the same neighborhood, downsizing to 3,000 square feet. The Simpsons scheduled major renovations on the house and then spent the following three months in France. 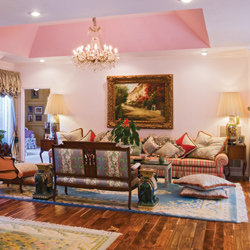 While they were gone, the flooring and kitchen countertops were replaced, a room was added, walls were removed, and the house was painted in various shades of pale pink. “It takes a real man to live in a pink house,” Skinner chuckles. That says a lot about his sense of humor and strength of character. The barroom is one of the areas that received extensive renovation; originally it was a porch. The room was enclosed and sliding glass doors installed for access to the yard; opposing walls are mirrored to reflect light from the adjoining garden. The wooden bar and stools originated in Italy. A small sofa across the room provides a cozy seating area. DeeAnn’s pride and joy is the small chandelier; it is crafted to resemble bunches of grapes and was found on a trip to the French Quarter in New Orleans. 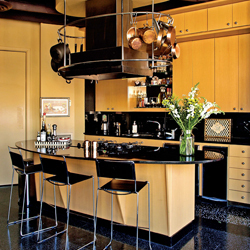 DeeAnn enjoys entertaining, and her kitchen is a cook’s delight. “Cooking is my passion,” she says. “The setup of this kitchen is very convenient; it’s very few steps from the stove to the sink and the refrigerator.” The durable countertops are a green marble from a river bottom in Brazil. The flooring is hand-scraped teak. The island houses a gas cooktop and features storage for pots and pans. One wall contains built-in cabinets for DeeAnn’s crystal collection and special drawers for her silver. Seventy-two unique hand-painted drawer pulls adorn the kitchen’s drawers and cabinets. The chandelier over the small breakfast table is of Venetian glass from Italy. A bay window overlooks the front of the house, allowing sunshine to provide the natural lighting DeeAnn loves. 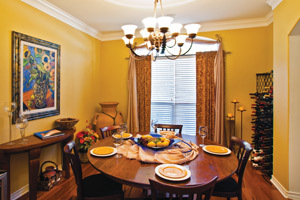 The kitchen walls are crowded with family photos and framed menus from their trips around the world. The menus are part of a collection of 400, each signed by the restaurant’s chef. They represent memories of a lifetime of good food and good times with friends and family. Three bedrooms were combined to create the master suite. The eye-catcher is a waist-high carving along one wall. “This piece is hand-carved wood from Taipei,” DeeAnn says. “We watched the little old men chisel away the wood to make this. We don’t know what the intended function is, but we think it’s beautiful.” A few feet away is a coffee table carved by the same craftsmen. Nearby is a black chest of drawers from Japan; various Oriental artworks hang on the walls. The narrow master bath runs nearly the entire width of the house, with a garden tub located beneath a large window overlooking the back garden. The long his-and-her vanity is of the same marble used in the kitchen countertops and living room hearth. Mirrors used judiciously above the vanity reflect sunlight from the window. At the far end of the bath, a door opens into the reading room. Family pictures and portraits are featured everywhere, from the long Queen Anne table beneath the large window to all the paneled walls. There are pictures of DeeAnn’s daughter as a Fiesta duchess in her court dress. At the far end of the room, a door opens to a private atrium. What more does anyone really need?